With the outbreak of World War 2, Riddles was appointed as the Director of Transport Equipment at the Ministry of Supply. He quickly adopted the Stanier 8F (LNER O6) 2-8-0 as the standard military goods engine. In 1941 he was appointed to the post of Deputy Director-General of Royal Engineer Equipment, and by 1942 had started work on a new "Austerity" 2-8-0 that took into account the lack of material and manpower. Construction started in January 1943, and a total of 935 locomotives would be built by May 1945 by the North British Locomotive Co. and Vulcan Works. 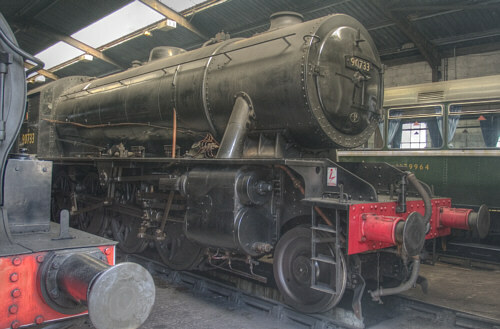 The WD "Austerity" was based on the Stanier 8F and included many interchangeable parts, but had a simpler parallel boiler with a round-topped firebox. This simpler parallel boiler consisted of two telescopic rings, and lacked any form of lagging but relied on a 2in airspace for thermal insulation. The LNER applied lagging to the "Austerities" in their ownership. Initially this was by using asbestos mattresses, but fibre glass was used in later years. The firebox design suffered some problems. The drop gate mechanism was in the ashpan and tended to warp and burn due to the buildup of ashes and clinker. The LNER removed the mechanism on many of its locomotives. The firebox design was also criticised for being too rigid. The LNER made this criticism in 1942 before construction and Sir William Stanier agreed, but it was too late to fix. In the immediate post-war period, cracks and failures of the copper firebox tubeplates were common. From August 1948, replacement copper tubeplates with 1in radius flanges were used in-place of the original 0.75in flanges. The steel plate used in one batch of the boilers appears to have had problems, and a number of boilers had to be scrapped before 1945 due to fractures. Walschaerts valve gear was used with cast-iron 19in x 28in cylinders. Piston valves were 10in diameter and designed for inside admission. A four-feed Detroit pattern 32A sight feed lubricator lubricated the cylinder barrels (2 feeds) and steam chests (2 feeds). Initially the "Austerities" were fitted with steam brakes and Westinghouse air brake equipment, but the LNER removed the air pumps from the O7s between 1946 and 1948. Before the Normandy Landings, the Army had very little use for these locomotives, so they were loaned to the "Big Four" railways. Of the 457 loaned during this period, the LNER had 350. After June 1944, "Austerity" locomotives were shipped out to France. Initial allocations from the LNER actually went to the Great Western Railway (GWR) and Southern Railway (SR), but by February 1945 all of the initial "Austerities" were transferred to the Continent. No. 7337 experienced severe damage at Soham (Cambridgeshire) on 1st June 1944 when an ammunition wagon exploded. The event has since become moderately famous due to the quick action of the engine crew that almost certainly saved the village. Driver Gimbert noticed the first wagon was on fire, and proceeded to stop the train. The crew disconnected the wagon from the rest of the train, and was in the process of hauling the burning wagon away from the village when it exploded. The resulting explosion made a crater 66ft diameter, and destroyed both the station and stationmaster's house. Fireman Nightall and signalman Bridgers were both killed, and driver Gimbert was seriously injured. Nightall and Gimbert were both awarded the LNER Medal and the George Cross for their actions. In September 1944, No. 7337 was rebuilt with a new boiler. After the end of World War 2, the British Army had large numbers of the locomotives surplus to requirements and they started to return to the UK in November 1945. The LNER offered to take many of these on loan. At the end of 1946, the LNER purchased 200 "Austerities" including 190 that it already had on loan. With the ownership becoming permanent, the "Austerities" were classified as "Class O7" in January 1947. By the end of 1947, the LNER had also taken on an additional loan of 270 O7s. Many of these needed quite a bit of maintenance work, and it was not until July 1948 that the last entered service. The "Austerity" locomotives were designed to be easily converted to oil firing if required. This was attempted by the LNER in 1947 during the post-war fuel crisis. No. 3152 was converted, but suffered problems maintaining boiler pressure at speeds above 35mph. This was solved by lifting the burner above the fire door peep-hole, and by lengthening the brick arch. No. 3102 was due for conversion, but this was cancelled and No. 3152 was converted back to coal burning in October 1948. The WD "Austerity" O7 locomotives were mainly used by the LNER for the same kinds of duties that their other 2-8-0s were used for, namely freight and heavy mineral traffic. A number of instances of wartime passenger workings have been recorded. These were mainly locomotives built by the North British Locomotive Co. that were being run-in at Eastfield. The locomotives built at Vulcan Works were run-in at Gorton, and typically hauled trains on the Great Central main line to Woodford. Allocations tended to displace the older Gresley 2-8-0s (classes O1 & O2) to less strenuous work. Most sheds that handled freight traffic received O7 allocations, although Doncaster is notable for its complete lack of any O7 allocations other than No. 3152 during the oil-burning trials. After Nationalisation (1948), the British Transport Commission purchased a further 533 "Austerities" in addition to those already purchased by the LNER and the other "Big Four" railway companies. On 26th January 1949, British Railways (BR) dropped the "O7" classification and re-classified the "Austerities" as "WD 2-8-0". The "Austerities" also gained the nickname of "Bed Irons" after the loud clanking noises produced by their motion. Although three WD 2-8-0s were withdrawn between December 1959 and February 1960, scheduled withdrawals did not start in earnest until 1962. The last five WD 2-8-0s were withdrawn in September 1967. Boiler diagram was reclassified from LNER Diagram 119, to BR Standard BR10 from July 1950. Heating Surface: Total: 1978 sq.ft. None of the LNER O7s survived into preservation, although one WD 2-8-0 has survived. Works No. 5200 was built by the Vulcan Foundry in 1945 and sent to Europe, where it joined the Swedish strategic reserve. Heavily modified in Sweden, it was purchased by a group of volunteers at the Keighley & Worth Valley Railway (K&WVR) and operated services until 1976. This locomotive has been restored back to original condition with a rebuilt tender and new cab, and it has been numbered 90733, continuing the sequence of BR-numbered 2-8-0 Austerity locomotives. No. 90733 returned to traffic in summer 2007. A handful of the LNER's O7s received unofficial names. No. 77138 was named Lisa whilst in Continental Europe, and No. 77337 became Sir Guy Williams whilst on the Longmoor Military Railway. The Longmoor Military Railway also gave a name to its non-LNER "Austerity": No. 401 Major General McMullen. The last "Austerity" to be built, No. 79312, was named Vulcan and continued to carry its name plates after Nationalisation. An N gauge (2mm scale) kit of the O7 is produced by Foxhunter. Bachmann produce a OO gauge (4mm scale) ready-to-run model of the WD 'Austerity'. OO gauge kits are also available from DJH, and Falcon Brassworks. ETS sell an O gauge model of the O7 'Austerity' in BR black livery. Thank you to the P.H. Groom collection for permission to use the above photograph of O7 BR No. 90924 at March. Thank you to Rob Marsden for the photograph of the preserved No. 90733 at Haworth.